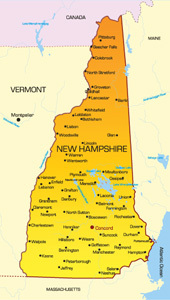 New Hampshire was the first state to break away from British control in 1776 and is nicknamed The Granite State. The state is the 5th smallest state in the United States with a population of just over 1 million people. The capital city is Concord but the largest city is Manchester, which is home to 110,000 people. The bordering states are Maine, Vermont, Massachusetts, as well as Canada and the Atlantic Ocean. The major highways servicing the state are I-89, I-93, and I-95. Other modes of transportation such as air travel are facilitated through airports like the Manchester-Boston Regional Airport. Notable colleges located in the state are New England College and The University of New Hampshire. Attractions like the Manchester Motor Speedway bring tourism to the state as well.